Bird nests are intricate, amazing structures, far more than just piles of sticks or grass. Some birds even go to great lengths to create elaborately decorated nests – but why? What purpose do extra decorations serve, and why do birds bother expending time and effort to turn their nests into works of art? Unlike structural supports that are woven into the nest or wrapped around the bulk of the nest to keep it intact, decorative accents are usually positioned only on the outside of the nest cup. Some birds may decorate only the rim of the nest, while others add accents all over the cup. Some birds even add decorations close to the nest, such as on adjacent branches. By definition, nest decorations are not structural and do not help keep the nest itself intact. Why, then, do some birds use so much time and effort to decorate a nest? There are three main purposes behind nest decorations. Bits of plant material strategically placed to decorate a nest can effectively camouflage the nest structure and hide it from intruders and predators. This helps protect not only eggs and chicks, but also brooding adults that do not want to abandon their nest. Good camouflage can keep brood parasites away from the nest, as well as unwelcome egg dumpers. 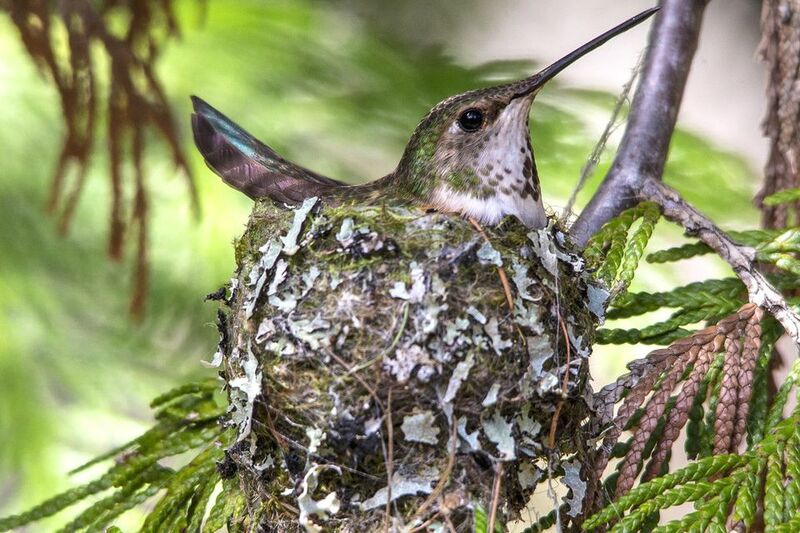 Many hummingbirds camouflage their nests with lichens and bits of moss, while dippers and ouzels use moss and aquatic plants to disguise their nests near waterways. Arboreal birds are more likely to use bits of leaves and bark to hide their nests in trees. Many birds use colorful plumage or elaborate courtship displays to attract mates, and a beautifully decorated nest can serve the same purpose. Unusual decorations or bright colors may attract a mate's attention, and the more extreme the decorations, the better the chances of attracting a strong, healthy mate. Many male birds decorate nests to attract mates, even if the females will ultimately select a more camouflaged, hidden nest site to lay their eggs. Bowerbirds are the most elaborate nest decorators, creating extensive sites with colorful materials to woo their mates. An elaborately decorated nest can be a powerful communication tool. The more intricate the nest, the more it advertises strength, intelligence and territory, which can warn off less able competitors. Black kites use white plastic to decorate their nest, and the amount of plastic in the nest often communicates the birds' age and experience, yet it is not a part of their courtship rituals. No matter what the reason for decorating a nest, its overall beauty and impressiveness is in the eye of the beholder. Even an intricate structure and delicate weaving, such as the dangling pouch nest constructed by the aptly named weavers, can be a type of decoration that stands out to different birds. There is much more to discover about how wild birds decorate their nests, and ornithologists are continuing to study this phenomenon to learn more about birds and their nesting habits. While some nests are obviously meaningful works of avian art, nearly any type of nest could have an odd piece of colored string, a random flower petal or an unusual piece of trash in its structure. This does not mean that every nest is decorated – birds can be very opportunistic about their nesting material, and they will use any suitable items to craft their nests. Even when used inadvertently, some of those materials can be startling decorations – such as a bit of tinsel wrapped into an otherwise drab stick nest. Birders can help birds spruce up their nests by providing a suet cage nester with colorful yarns in safe materials and lengths, but it is important to avoid the worst nesting materials for birds – no matter how decorative they may be, they're just not safe for birds to use. By understanding more about how birds decorate their nests – even if they don't mean to – birders can better appreciate all the intricacies of nesting and what wild birds must do to raise their families.